Baltic Birch Panels are popular with artists because of their firm, smooth surface, neutral color, strength, and affordable cost. 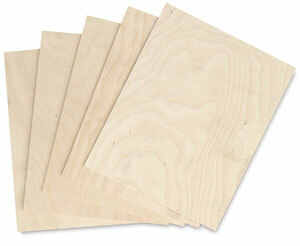 The smooth, sanded surface and edges on these Baltic Birch Panels make them ideal for detailed work. They also can be used with oil, acrylic, and encaustic paints — and they're a great surface for mounting prints, canvases, collages, and other mixed-media artworks. Baltic Birch Panels are available in a variety of popular sizes, including square sizes, in convenient packs of five panels. Each panel measures 1/8" (3 mm) thick.